Last weekend at Con of the Rings, the new Adventure Pack of the Ered Mithrin cycle dropped. It was available for purchase by every attendee of the Con, a few days before general release. This meant that we got to see and play with new cards and a brand new quest. So let’s discuss the various player cards again, and do a quick run down of the scenario, as there are a few things you need to know about it before your crack it open. We are 2 for 2 on shirtless heroes in this cycle already, shame that Thranduil in the next pack doesn’t continue the trend. I have been looking forward to Haldan, and have proxied him in my decks for a few weeks before I got the pack. His 3 attack is what really stands out for me, as Lore isn’t known for having high attack stats on their heroes or allies. 3 is about the best you can get, and I am happy that Haldan can use it besides another stat on him. He is not a hero to throw in any deck, which is something that could be done with Grimbeorn. Haldan needs attachments on locations to really shine. 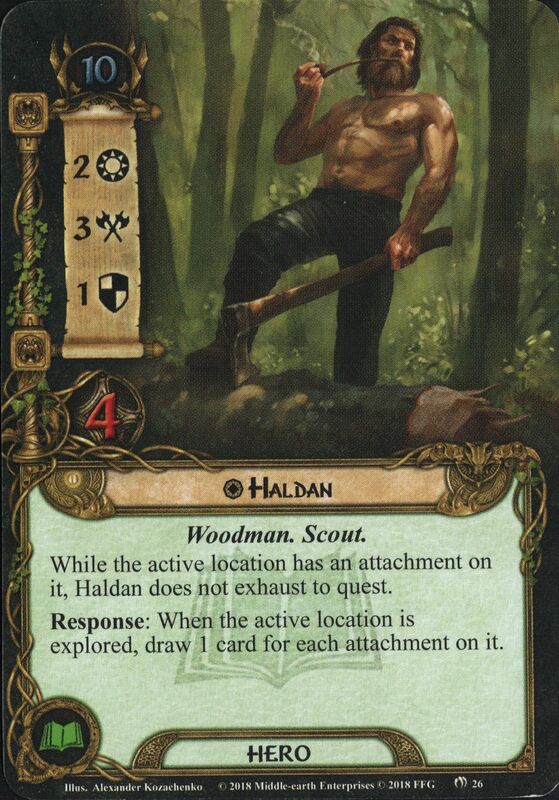 As soon as the active location is fitted out with an attachment on it (player or encounter), Haldan does not exhaust to quest, making good use of his willpower. You then have him ready to attack during the combat phase or to use him for Scout shenanigans with Guarded Ceaselessly or Quick Ears. Being able to use him for multiple things is very welcome, and having Haldan on the table is a lot of fun in my test games where I have beaten both CE quests with him in a multiplayer environment. His card draw is also a nice way to refill your hand with attachments, even if you aren’t the first player. Combine this with Ancient Mathom for even more card draw, as long as you are first player. I have come to like the Woodmen synergy a lot during my testing and have found it to be a fun archetype in multiplayer. I wonder what other decks people come up with for Haldan, but here at least is my take on him. Wiglaf is a reference to the old Beowulf story and fits in well in this narrative. As a Dale ally, his 5 cost will not seem as steep, as King of Dale will make it a 2 or 3 with ease. This certainly makes Wiglaf a mid- to late-game ally, who can pull some decent weight on his own. However, it is not just him that you are getting for his cost. When you play Wiglaf from your hand, you will get to play any Item attachment from your hand on him for free (assuming it can attach on an ally). This has some nice combo’s with the new Ancestral Armour attachment in this very pack. Other nice cards for him to use are Raiment of War, or any of the recent attachments for allies. This ally slots in nicely in any Dale deck that looks to get more attachments out for cheap. Players can even barter the cost-free attachment back to their hand to reduce the cost of the next attachment on any character. This adds to the flexibility of the ally. On top of the cost-reduction, Wiglaf also gets to ready himself once per phase by exhausting an attachment on him. This can be just basic stat boosting attachments which do not require to be ready for any effect. 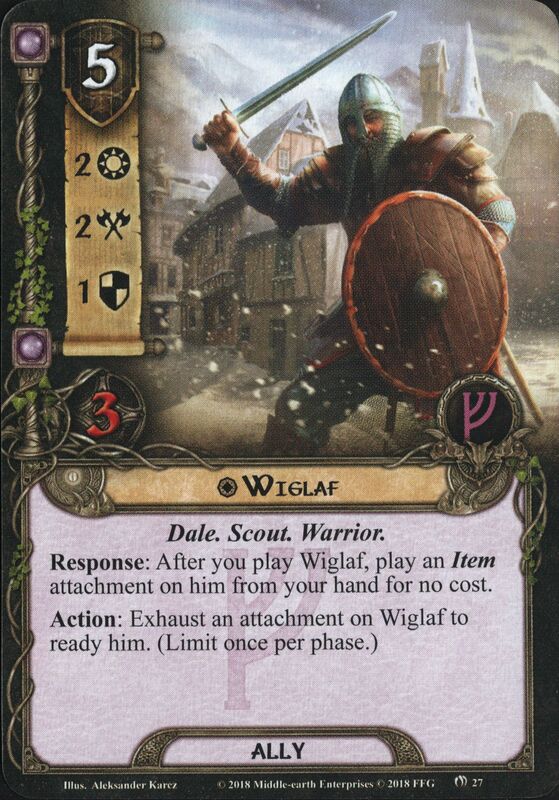 This can make Wiglaf into a powerful ally that is pretty versatile in a Dale deck that can distribute attachments easily. This Creature ally is the perfect hybrid between ally and attachment, while also making sense in a thematic way. Players can play the Stallion as if it were an ally, and just keep it on the board for the rest of the game. However, during each Planning phase (including the one where he entered play) the controlling player can choose to trigger a one time action in which the Stallion gets tamed and attaches to another ally you control. If attached, the Stallion counts as a Mount attachment which grants the attached character +1 to all stats. This makes defenders like Jubayr a great target, since they benefit from both the hitpoint and the point of defence. The static buffs are good on any ally you have, but if you would attach it to the Guardian of Esgaroth, he would gain +2 to all his stats straight away from the Stallion and his own effect. The best part is that you can keep the Stallion in play as an ally when looking for a good target for this horse. You can even use the Stallion for effects like A Very Good Tale to bring out more allies, and attach him to one of the allies you just put into play. I really like how the Stallion works in theme and in the game itself, and I can’t wait to see it in action. Too bad this doesn’t justify Radagast yet outside of an Eagle deck. The Eagles are back! After a break of 3.5 cycles, we finally get more Eagles as player cards. 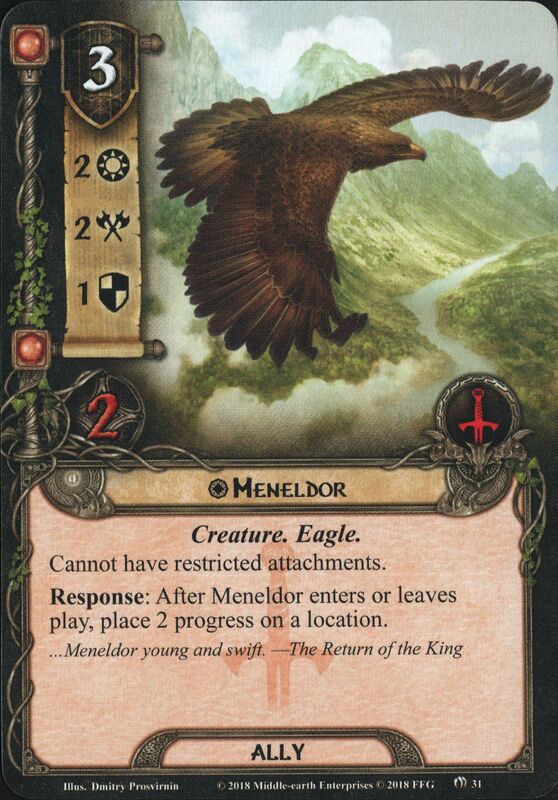 This unique Eagle immediately sets a high standard for other Eagles to come, as Meneldor solves a big problem for Tactics players: Location control. Meneldor will place 2 points of progress on any location (active or in staging area) when he enters play and when he leaves play. This reminds us a lot of the Descendant of Thorondor, which did the same with damage. This means that you can play Meneldor, ping a location for 2 progress, either chump or return him to hand with another way (Flight of the Eagles, which we will discuss later), place 2 more progress on a location. This makes him do more progress per round than Asfaloth, potentially clearing a 4 quest point location in one turn. To make things a bit cheaper, use him with Hirgon, as you will likely need to save some resources for him. Also note that Meneldor has 2 points of willpower, which is quite generous on a 3 cost ally in Tactics. It isn’t often we see this besides Grimbold and Bofur. Mono-tactics decks will love this new Eagle, and will find a lot of ways to bounce him in and out of play, clearing locations. The downside to Meneldor is that he is unique, so you can not spam 3 of him in play at the same time. However, this saves you some deckspace, as 2 or maybe even 1 copy will be enough to keep him around for a while. Note that he can be found easily with The Eagles are Coming! Let’s continue the Eagle party with this combination of two cards that will also see a lot of play in Eagle decks. These two cards work together like Ranger Summons and Flight to the Sea since they put a card into the encounter deck. For Tactics, that card is a useful Eagle ally that I will get back to. First, let’s talk about the event itself. 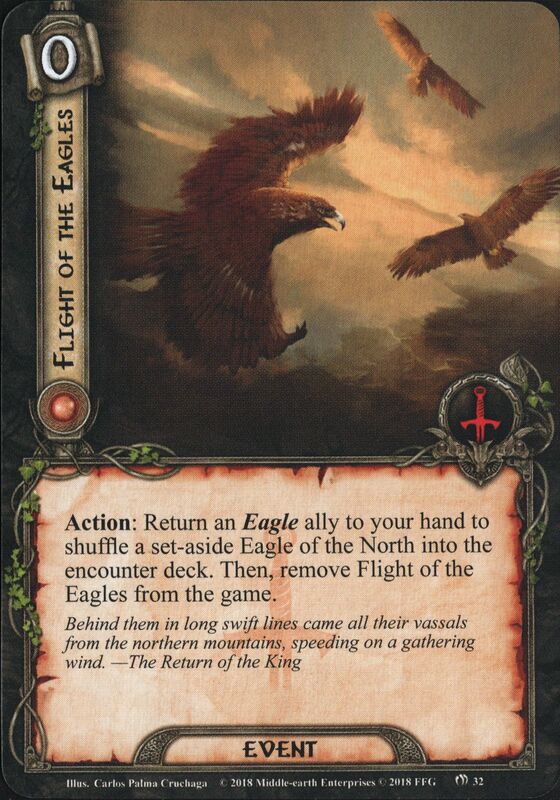 Flight of the Eagles costs no resources, but requires you to return an Eagle from play to your hand. Ideal targets for this are Meneldor and Descendant of Thorondor, as they are looking for excuses to leave play so that they can trigger their Response again. You cannot however, put that Eagle underneath Eagles of the Misty Mountains, as that does not satisfy the cost of the event. The Eagle must be in your hand again before you trigger the next part. Once you’ve returned the Eagle to your hand, you may add one of the set aside Eagles of the North into the encounter deck. 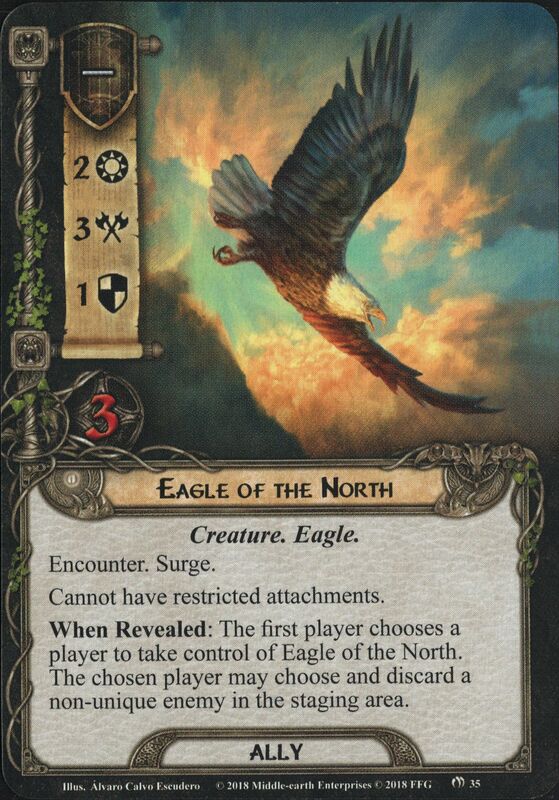 Remember that the encounter deck can only have 3 cards in it with the encounter keyword, so no-one else should be running Wind from the Sea or Ranger of the North while you want to place your three Eagles in there. The Eagle ally you put into the encounter deck will remain there until it is revealed form the top of the encounter deck. Note that the Eagle does not come in when discarding cards from the top of the encounter deck, nor if it is dealt as a shadow effect. Once it gets revealed, the first player chooses a player to take control of the Eagle who then puts it into their play area. That same player may then choose and discard any non-unique enemy from the staging area. This works well if the Eagle is revealed after a big non-unique enemy was added. Remember that this card will surge into something else though, it is not a free encounter card like Wind from the Sea. The ally itself isn’t half bad either. It’s 2 willpower is great in the hands of a Tactics player, and it’s 3 attack will come in handy against other enemies. If you are playing an Eagle deck, try to run this combination of cards, it will definitely pay off. I’ve seen players discard Wraith on Wings with this Eagle, which was great! This was another one of the unspoiled cards and I was amazed by how well this works with the Woodmen cards in this pack. There is a lot to read on this event, but it boils down to this: Play the event to make a location with at least one player card attachment on it the active location. This bypasses the Travel cost for that location and moves any previous active location back to the staging area. Then, after it has become the active location, players get to lower their threat by the number of attachments on the moved location. This means that in a dedicated Woodman deck, you can stack some attachments on a location with a nasty travel effect. Then, you play this event during the Travel phase and everyone gets to lower their threat. This ties in to the multiplayer friendly nature of the Woodman deck, and is in some case even more effective than a Galadhrim’s Greeting for the group, for 0 cost! Now I do agree that this card will require some deckbuilding around it, but if you are playing a location control deck with attachments on locations, slot this in your deck to at least cancel the travel effect of a location. It’s not a splashable card, but it is great fun pulling it off. Need some fuel for South Away? Here it is! Woodmen’s Path is a card I initially misread to say that you lower the quest points BY one. But it actually reads that you reduce it TO one, which puts this card on a whole new level. This card can clear out annoying locations like those that scale with the number of allies, or some NM locations with 7+ quest points. Just reduce the points to 1 and explore it straight away after it becomes the active location. 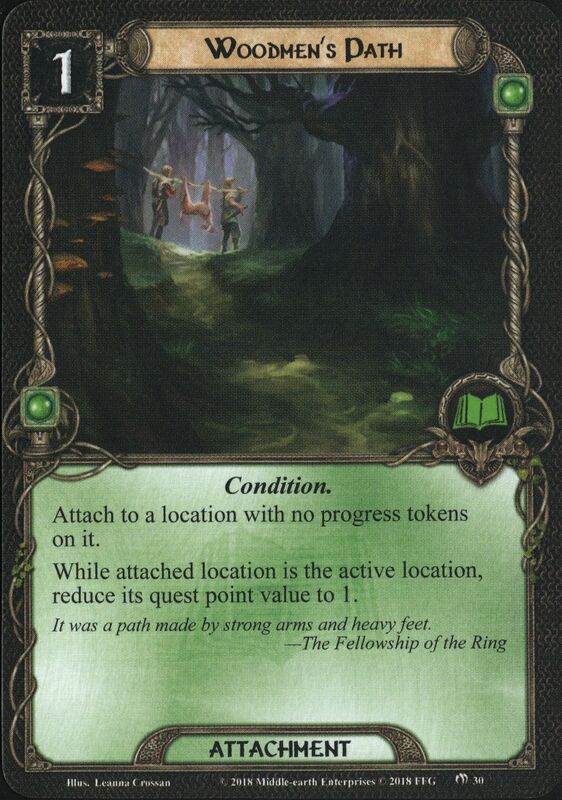 The catch to this card is that it only reduces the quest points on it to 1 once it is the active location, so players must still travel to the attached location in order for Woodmen’s Path to matter. This is where South Away comes in handy. When the location is active, you can simply use any location control at your disposal to clear the location and be rid of it. There is another thing that is important to note with this card, you cannot attach it to a location with progress on it. This makes you want to hold back on using Northern Trackers, as it can potentially hinder Woodmen’s Path. But since there are many ways of cheating locations into play, there will always be a target for this attachment, helping you deal with location lock. Just remember that multiple copies of this on one location is useless, but does increase the card draw from Haldan and the threat reduction of South Away! I feel like we all knew that this sword was coming once we saw Orcrist in an upcoming pack, but it is nice to play around with more unique weapons. Lore can really use a +2 attack weapon since their heroes don’t really shine in the attack department without resorting to side-quests and Legacy Blades. Glamdring doesn’t require that much setup, especially if you manage to guard it by a location. I like the nod that this weapon can attach to ally Gandalf, though it is only good on OHaUH Gandalf, which would make for a funny deck that builds up the ally with Narya and Glamdring, all the while keeping him in play for the cost of more threat per round. The response on Glamdring is the same as the Hobbit Treasure card, and is not limited to how many times you can draw cards with it, as long as you keep killing enemies. The card draw that the weapon provides is nice, but I doubt that it is necessary, as Lore tends to draw enough cards on its own. However, get this weapon in the hands of a Leaderhip or Tactics deck, and they will thank you for the boost in cards that they receive. Just imagine this weapon in a Tactics Aragor-Merry deck that keeps on killing enemies! Remember that the Guarded player cards are really dependant on what sort of quest you are up against. You should really ask yourself if it is worth revealing an additional card for the benefit of this weapon. This is a big attachment, costing a whopping 4 resources to get into play. The Ancestral Armor is a buffed version of Ring-mail, with the restriction that it can only attach to Leadership or Noble characters. This includes some big unique allies like Glorfindel, but it can also buff medium Leadership allies like the Warden of Helm’s Deep. Note that Beregond is neither Leadership or Noble, so he will have to stick to Gondorian Shield and Citadel Plate for his defence/hitpoint buff. The attachment will give the attached character +2 defence and +2 hitpoints, but will take up a restricted slot and is limited to 1 per character. This makes any character into a decent defender, but since it is an armor attachment, it makes the Redwater Sentry even better. There are a host of characters that this attachment will be go on, like the Sentry and the Guardian of Esgaroth, but on heroes like Erkenbrand and Theoden, this attachment is worth while too. The downside to the Ancestral Armor is that it is pretty expensive, and falls out of the range where Galadriel can play it for free. However, 4 cost in Leadership is not terrible, and should be achievable with a bunch of resource acceleration on the table. Remember that there are ways to cheat this attachment into play as well. Both Well Equipped and Wiglaf can potentially play this attachment for free! Before talking about the quest itself, an important note: The symbols on the quest cards are wrong! Do not pack Gathering Gloom in the encounter deck but instead use the Lost in the Wilderness encounter set (symbol with the hood). This balances the encounter deck and makes the quest a bit easier on you. We have played a few games with this encounter deck, and lost hard. If you follow the instructions on the rules insert, you should be fine. Roam across Rhovanion is another long quest that feel like it is best played with 2-3 players. 4 players invites location lock and makes it hard to survive the treacheries that come out of the encounter deck. Since many stages require all players to reveal an additional encounter card per additional player, the cards in the staging area can start to pile up. The quest is split in 3 different stage 2, where you retrieve an objective for your Goblin objective ally that you encountered at the end of Withered Heath. Once you rescued its friend and claimed both his horn and the key to Gundabad, you progress to stage 3. At this stage, the objective allies turn to their enemy side and you suddenly have to fight a big mountain troll and a very annoying goblin. There is a certain set of requirements that must be met before you can defeat the enemies, so the in depth article will be interesting. The locations in this range from useful to brutal, with one location shutting down placing progress in the staging area. This will make the location lock an even bigger problem in high player counts. The enemies in this encounter deck are also not mild, as Eagles tend to ambush the first player, and huge Giants tend to stomp all over your defenders. However, the number of enemies in the encounter deck feels small, making this more of an exploration quest where you are given plenty of time to set up before the final confrontation. Time and more attempts will tell if I like this scenario. I like the fact that you first help your enemies get their gear and are then betrayed, though it gets hinted at often, so it doesn’t come as a surprise. The environment is pretty nice though, and the enemies are a nice blend of big Trolls and annoying birds. The difficulty of 5 seems pretty accurate, as it is not a quest you really have to build for, but it is not a casual walk in the park either. I hope to get to this scenario in a separate article at some point, hopefully by then new tricks have been invented to make this quest easier.